Limited time only! 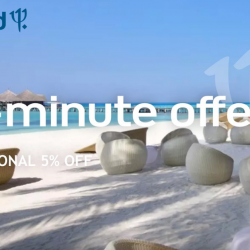 ClubMed: Last Minute Offer with Additional 5% OFF All-Inclusive Stays at Bintan, Bali, Phuket, Maldives & More! Book your All-Inclusive stay at selected ClubMed resorts from 3 weeks to 1 day before departure and enjoy an additional 5% off current promotions! Travel between 27 March to 16 April 2019, with prices from $402. You only need to book the flight!